Let’s take a look back at some of the things that stood out from Week 15 in the National Football League! – It took them 15 weeks but the “greatest show on turf II” was resurrected in Week 15 against the Jacksonville Jaguars. Matt Ryan looked good, Roddy White constantly looks good and the Falcons defense did pretty well in this one also. Granted it was the Jaguars but the Falcons are looking pretty good as we get closer to the NFC playoffs. – I guess it really didn’t matter if Jack Del Rio was the Head Coach in Jacksonville or not. The more things change, the more they definitely stay the same. I’m also beginning to wonder if Blaine Gabbert is the franchise QB they drafted, I would not be shocked if they take USC QB Matt Barkley if they have the chance in the 2012 Draft. – Dallas did what they needed to do in the Saturday game and that was getting the “W.” Granted it was against the Tampa Bay Buccaneers but a win is a win especially right now where they need as many wins as possible to make the playoffs. Romo looked great in the game and I’m interested to see how Felix Jones performs for the Cowboys down the stretch. - Remember when the Tampa Bay Bucs had a feared defense? Remember when they won 10 games last season? You would have never noticed it with the way they have played lately. I hate to say it but Raheem Morris is most definitely on the hot seat right now. – How is it that the Buffalo Bills have become the bottom feeders of the AFC East while the Miami Dolphins have surpassed them? Remember that excitement that Bills were giving football at the start of the year especially after they beat the Patriots? Seems like it was centuries ago now. – Reggie Bush’s career has been revived by the life support of the Miami Dolphins this season. When you rush for 203 yards and consistently put up good numbers you deserve props. I wouldn’t be shocked if he wins the NFL comeback player of the year award. – I can’t believe it but the Seattle Seahawks are in the running for the playoffs still. I know, I’m just as shocked as you but they are playing very good during this final stretch of the season. Should they pull off the upset and make the playoffs this team is…and I can’t believe I am saying this…one to look out for simply due to the momentum they have build. – Tough season for the Chicago Bears as this one is almost over for em. Losing Cutler and Forte hurt a lot & now you can add Johnny Knox to the list of injuries. Lovie Smith’s time in Chicago may be done as well; they’ve needed a fresh face in that head coaching position for quite sometime now. – The Indianapolis Colts won their first game of the season. Enough said. 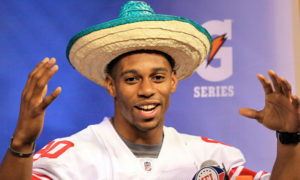 – I guess the Tennessee Titans are allergic to wanting to play in the playoffs as they lose to a 0-13 team in Week 15. If you want to play beyond January 1st you need to win these types of garbage games. They got outplayed by a team that had no heart left and now will be sitting home in January; the Titans ruined their own destiny. – While you can write them off (like I have) the Bengals are still in pretty good playoff contention thanks to win on Sunday and the Jets loss. If they make the playoffs I believe Marvin Lewis should be discussed in the running for Coach of the Year for sure. I can never remember a time an NFL team has been successful while being led by a rookie quarterback and rookie wide receiver. – St. Louis has a ton of issues and problems that may be worse then any other NFL franchise. I don’t know where they start when it comes to building this franchise back up. At least they have Sam Bradford at quarterback…when healthy. – New Orleans continues to prove to me that they are the team that could best knock off the Green Bay Packers in the NFC playoffs. The Saints are the veterans of this NFC playoff party and should be looked at as such. They can easily accomplish the ultimate feat in the NFL and win the Super Bowl this season. 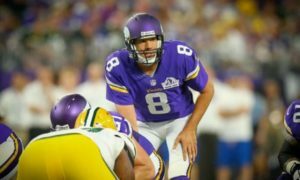 – Unlike the St. Louis Rams at least the Minnesota Vikings have weapons in Adrian Peterson, Percy Harvin, Jared Allen and a promising QB in Christian Ponder. This team reminds a lot of when the Lions were being rebuilt (again) a couple years ago. This team could return to their glory sooner then we think. – Just like the Tennessee Titans, when you are in a playoff hunt you need to be the teams that you can easily push out of your way…right Giants? With your destiny at your fingertips and everyone else in your division in your rear view mirror you CANNOT lose to the worst team in your division. Giants got what they deserved again and lay that “December stink bomb” they have traditionally done the last couple of seasons. – Roy Helu looks like he will be a really good running back in the near future and if I was Washington I’d do whatever I can to try & draft a “QB of the future” in the 2012 NFL Draft. Washington can put it together if they start picking up the right pieces and not go through free agency like in years past. – I know Houston has clinched their division but you need to finish your season strong, especially in the AFC where you can easily squeak into a first round bye if you keep winning. Texans continue to show inconsistency and prove to everyone that they are the highest seed in the NFL playoffs this season that you want to play in January. The Texans do not scare me at all, that’s why the should be doing whatever it takes to make sure they get a first-round bye! 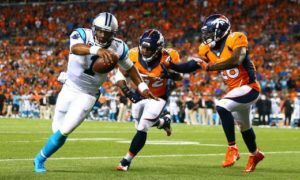 – It wasn’t your typical Cam Newton and the Panthers game but it got the “W” against a team that will play in the postseason. A very surprising and good Panthers season continues. I really think they could finish the year off strong and get to 7 wins in these last two weeks. – So the undefeated streak in Green Bay is over and it may be the best thing to happen to the defending Super Bowl Champions as they can now focus on the playoffs & not history. They enter the next two weeks banged up with injuries to their best wide receiver, first string running back and offensive line. I look for the starters not to play this much and Green Bay probably ending the season 14-2. That Week 17 matchup has Lions win written all over it. – Great win for the Kansas City Chiefs, they played terrific in this one and it showed. It locked up Romeo Crennel as the Head Coach for the Chiefs for next season at least. This is a team that without the injuries could have been playoff bound in my opinion. – This game had the most playoff implications out of any Week 15 game as the Detroit Lions edged out a last minute victory over the Oakland Raiders. Detroit played well in this game but nothing like they did at the start of the season to make me think they were legit NFC threats. That obviously can all change in a week or during a stretch to end the year off. – Oakland’s hopes aren’t done yet but with the San Diego Chargers creeping up and the Kansas City Chiefs of all people not too far behind you have to start wondering if Oakland can hold up. Obviously all of those hopes rest on the shoulders of the performance of the Denver Broncos during these final two weeks. The AFC West is most certainly getting interesting. – Tebow has met his match finally as the New England Patriots put a pretty good whooping on the Broncos and prevented “Tebow time” from taking place this week. Denver came out strong in the first quarter but that was just about it as their flaws were showcased to the rest of the NFL by a veteran elite team. Denver is still in the driver seat for the playoffs but I wouldn’t put them as the favorite the media wanted them to be. – New England showed the rest of the league and probably the world exactly what Denver is: an underachieving team that is overachieving. You can’t take anything away from what the Broncos have accomplished but they are the AFC’s version of the 49ers in my eyes. Good win for New England as they continue to beat down teams on their very easy schedule. – If you are in playoff contention and are playing a below .500 team you need to win. There is no reason why the New York Jets got blown out by the Philadelphia Eagles in Week 15. They enter the final two weeks of the season clinging onto hope rather then sitting in the driver seat. – I know I wrote them off a couple weeks ago but the Philadelphia Eagles are still in playoff contention thanks to the NFC East battle. It’s a long shot but could still easily happen. I’d also take Andy Reid off the hot seat right now; he is staying in Philly folks. – Add Arizona to the teams that can still make the playoffs but due to a long shot. Had this been a normal NFC West scenario, you know one where a team doesn’t win more then 8 games, the Cards would be right there in it. Really starting to feel like Kolb is out next season and John Skelton is in as well. – If you are Mike Holmgren and overseeing the day-to-day Football operations of the Cleveland Browns where do you go from here? There are no bright spots in Cleveland football and the one star on the team, Peyton Hillis, is probably lost to free agency next season. It’s going to be a long tough road for this Browns franchise. – Somebody break up the San Diego Chargers as they have played like “normal” the last two games. I don’t know what’s gotten into them but the Chargers the last three weeks have played like that dominant AFC West team they always were. They are now right behind the Broncos for the AFC West and also sneaking up on the Jets for the final Wildcard spot with two weeks to go. Watch out for this team. – Why can’t Baltimore play consistent!? One minute they are looking like an AFC favorite and the next they are getting blown out by the San Diego Chargers. I just don’t get this squad at all as they should be playing better then this, very disappointing week for the Baltimore Ravens as they get closer to the playoffs. – Out of all the games they have played this season the win over the Pittsburgh Steelers cemented them as a team that has to be taken seriously. They have had their ups and downs & they are no Green Bay or New Orleans but you cannot take them lightly. When your defense outplays the Steelers defense you will gain some confidence with the playoffs just right around the corner, great job by the Niners. – And the trend continues with the Steelers regarding teams that don’t get the win when they need it the most. The Texans and Ravens both lose in Week 15 & the Steelers cannot capitalize on the losses. The one that benefits from this all is the New England Patriots who are now in the driver seat as the AFC favorite entering the postseason.